From February until Easter, Dublin will be home to the biggest Easter egg hunt in the history of the state when over 100 fibre glass eggs will be secreted around the capital, each one decorated by well known artisans. John Nolan has just finished decorating one of the 2 1/2 foot eggs. He called his egg, “PEACOCK EGG”. Eggs will go on display on Pancake Tuesday 12th February for 40 days and 40 nights across Dublin. The locations of the eggs will not be revealed, its up to you to find the two and half foot eggs. It’s a family affair. Get the family involved in the Egg Hunt, all they have to do is find twenty eggs , each egg has a code which you have to identify to enter the draw for a grand prize (diamond pendant earrings for Mum, chocolate factory visit for kids, and a years supply of chocolate from Lily O’Briens) it’s fun and easy. 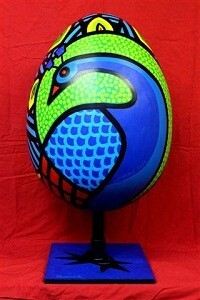 The eggs will then be auctioned for charity in aid of The Jack and Jill Children’s Foundation. The online auction will begin on 12th February culminating in a live auction at the Four Seasons Hotel on 23rd March. Anyone can buy them. The hand crafted eggs are destined to become highly collectible and valuable works of art. This entry was posted in Events on 5 January 2013 .